A non-profit organization that aims to land four astronauts on Mars in 2023 has signed its first deal with a supplier for the ambitious space colonization effort. The Netherlands-based Mars One has contracted with Paragon Space Development Corp. to perform a conceptual design study into Red Planet life-support and spacesuit systems, officials announced today (March 11). "We are extremely proud to have been selected by the Mars One team to provide such a vital role on the project," Paragon chief engineer and co-founder Grant Anderson said in a statement. "The objective of this conceptual design study will be to provide a well-defined pathway to mature the technologies and architectures required for long-term human habitation in the Martian environment." The work is not Arizona-based Paragon's first foray into the world of private manned Mars flights. The company is also providing life-support expertise for original space tourist Dennis Tito's Inspiration Mars Foundation, which plans to launch two astronauts on a Red Planet flyby mission in January 2018. 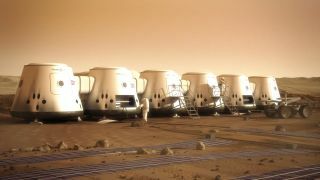 Mars One estimates that landing four settlers on Mars in 2023 will cost about $6 billion. The organization plans to foot the bill by staging a global reality-TV event, with cameras documenting all phases of the one-way mission from astronaut selection to the colonists' first years on the Red Planet. Mars One has also secured some money from investors, which it is using to fund conceptual design studies like the one being performed by Paragon. "At Mars One we thoroughly believe in the feasibility of our manned Mars mission, but we are well aware that the mission’s success is also dependent on securing finances to facilitate technological progress," Mars One co-founder Bas Lansdorp said in a statement. "We are, therefore, grateful to sponsors, donors, and other partners from all walks of life that contribute to our ambition to land humans on Mars in 2023." Mars One hopes the first four Mars colonists will form the vanguard of a permanent settlement that is bolstered by new arrivals every two years thereafter. There are no plans at the moment to bring any of these interplanetary adventurers back to Earth. The organization released its astronaut requirements in January and plans to begin its televised selection process sometime this year, officials have said.